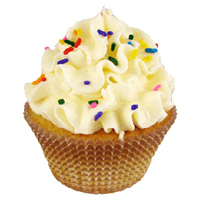 Our moist vanilla cake topped with a premium vanilla buttercream and colorful sprinkles. Mouth-watering buttercream chocolate frosting atop our decadent chocolate cake. 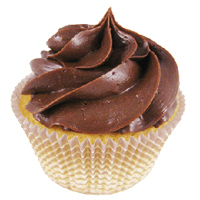 Light, delicious vanilla cake topped with creamy chocolate buttercream frosting. Fresh vanilla buttercream icing swirled atop our moist chocolate cake. 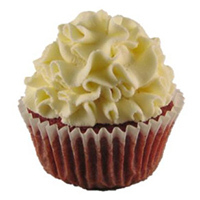 Southern red velvet cake perfectly complemented with our sweet cream cheese icing. Delicate cake bursting with the sweetness of fresh pineapple, banana, and coconut topped with our irresistible vanilla cream cheese frosting. Our most popular recipe Gluten-Free. 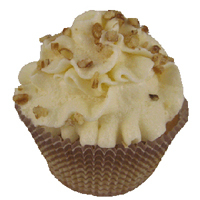 Banana cupcake filled with a scratch made banana pudding topped with fresh whipped cream and vanilla wafers. 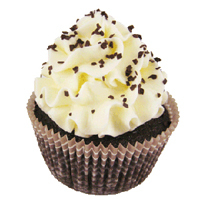 Rich and Chocolately cupcake with a delicious cream cheese filling topped with vanilla cream cheese. Vanilla cake filled with a vanilla pastry cream, glazed with chocolate ganache & a dollop of cream cheese frosting. Fudge brownie with walnuts topped with vanilla cream cheese frosting. Fudge brownie topped with a swirl of both peanut butter and chocolate buttercream frosting. Granny smith apple spice cake filled with caramel & topped with cream cheese frosting. Old fashioned carrot walnut cake with fresh orange cream cheese frosting. Classic chocolate cake centered with a peanut butter cup & topped with peanut butter frosting. Classic chocolate cake filled with caramel and pecans, topped with a chocolate ganache & pecans. Coconut cake topped with vanilla cream cheese capped with a cloud of shredded coconut. White cake with Oreos folded in and topped with cookies & cream frosting. German sweet chocolate cake topped with coconut pecan frosting. Classic chocolate cake topped with vanilla buttercream dipped in a rich chocolate ganache. Vanilla cake baked with toasted coconut & pecans topped with cream cheese frosting and toasted coconut. White cake with a tangy key lime filling topped with fresh whipped cream, graham crackers and a candy lime slice. Lemon cake with lemon filling and topped with lemon cream cheese frosting. Margarita flavored white cake topped with key lime cream cheese frosting. 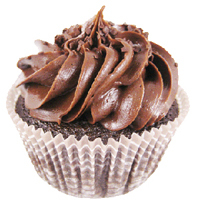 Dark chocolate cupcake topped with mocha buttercream & white and dark chocolate shavings. Dark chocolate cake with a swirl of both strawberry & vanilla buttercream & topped with a cherry. Pink lemonade flavored white cake topped with pink lemonade buttercream frosting. Cinnamon and sugar butter cake topped with vanilla cream cheese frosting and a light dusting of cinnamon sugar. Fresh strawberry cake topped with strawberry frosting. Fresh strawberry cake with a lemonade syrup topped with a swirl of both strawberry and lemon buttercream frosting.